My ultherapy practitioner told me that ultherapy cannot be applied to the sagging pouch like areas to the right and left of the mouth. Is this true? Can Ultherapy be performed after having radiation to the neck and parotid gland? I had a neck dissection over 6 months ago and 6 1/2 weeks of radiation. All in all, everything was completed just over 3 months. Has anyone had Ultherapy after radiation to the head and neck? If so, is it safe and what where the results? 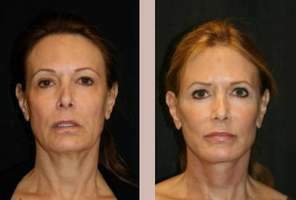 Can I have fillers injected at the same time as Ultherapy? Can I have fillers like Voluma, Radiesse, & Botox injected at the same times as my Ultherapy procedure? How long do I have to wait after being treated with Exilis before I can get Ultherapy on the same area of my face? I had an Exilis skin tightening treatment 4 months ago on my lower face and neck, but I want to improve the results by undergoing Ultherapy. How long do I need to wait before I can have this new treatment? After a face lift, how long should I wait before having an Ultherapy brow lift? I recently had a face lift and now want an ultherapy brow lift. How long should I wait before having the brow lift? Is ultherapy safe? How long do the effects last? Can this treatment lift the eyebrows? Is Ultherapy useful for the neck bands aquired from aging? I am 62 and don't have a double chin or neck fat, just two bands that look a little like a turkey. A face lift is out of the question for me. Will Ultherapy work? Is ulthera approved for use on all skin types and colors? Can this procedure be used on people of color? All of the testimonials have been on lighter skin people.